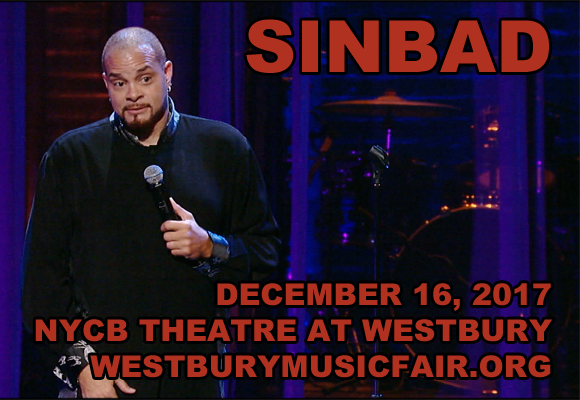 Feel-good comic and NYCB favorite Sinbad returns to NYCB Theatre at Westbury on Saturday 24th November 2018 for a night of utter hilarity! Throughout his 30 year career this celebrated funnyman and actor has gone from strength to strength and is still one of the most hysterically funny voices out there! Prepare to chortle your way through the night as Sinbad brings his honest, refreshing and comical observations to the stage – he'll get you belly laughing in no time! American stand-up comedian and actor Sinbad first made a name for himself in the late 1980s and 1990s, originally appearing as a stand-up comic on the television show Star Search, where he competed against fellow comedian Dennis Miller and continued through to the finals, where he lost to comedian John Kassir. This led to a stint hosting It's Showtime at the Apollo from 1989 – 1991, and in 1990 he recorded his first comedy special for HBO called Sinbad: Brain Damaged. This was followed by a 1993 award-winning stand up special in New York City's Paramount Theater at Madison Square Garden called Sinbad – Afros and Bellbottoms. During this Sinbad was also embarking on an acting career, with a recurring role in the Cosby Show spin-off A Different World from 1987 – 1991, and later starring in his own sitcom, The Sinbad Show, from 1993 – 1994. Over the years he has starred in several films, including Necessary Roughness, Houseguest, First Kid, Jingle All the Way, and Good Burger, and has continued to cameo on various television programs, as well as touring with his stand-up comedy.